The long-serving chairman of the Supervisory Board of Alrosa, the state diamond mining monopoly, Finance Minister Alexei Kudrin(background image), has announced he will step down at the next Alrosa shareholder meeting scheduled for June 30. Kudrin’s exit from the board has been ordered by a presidential decree, issued on April 2, requiring senior Russian ministers to vacate their seats on state-owned company boards. A press statement, issued yesterday by the Finance Ministry, said that Kudrin is complying with the “request [sic] of the Russian President Dmitry Medvedev on April 2, 2011 for the implementation of priority measures aimed at improvement of the investment climate in the Russian Federation.” The wording of the ministry release appears intentionally to detract from the presidential fiat. 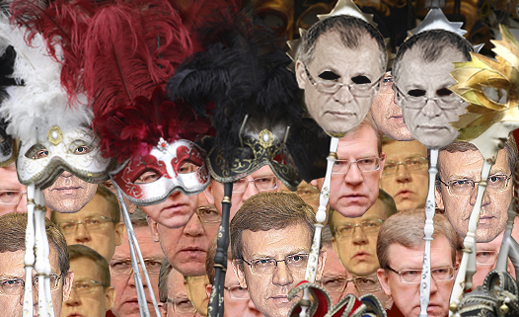 Yesterday’s Finance Ministry statement says Kudrin will be leaving the boards of state-controlled VTB Bank and Alrosa. A well-informed source among Moscow diamantaires told Polished Prices.com that he does not expect a board shakeup to accompany Kudrin’s departure. He believes the likely candidate for chairman of the board will be a Kudrin stand-in — Deputy Finance Minister Alexander Akhpolov (foreground image). Akhpolov, 55, is an Ossetian who spent much of his career in financial and tax administration in the Russian federation republic of North Ossetia. In Moscow since 2001, he has been in charge of the financial flow control and administration of the Finance Ministry. He is not known to have had previous experience in the diamond sector.